PRIMEX is early this year to align its dates with Casino Beef Week. At the 100-day launch in Casino yesterday Norco Primex director Bruce Wright admitted it had come round quick. 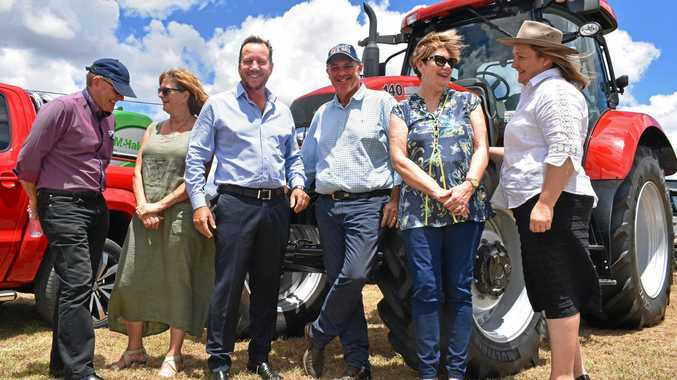 "It scared my pants off that there was only 100 days to go," Mr Wright told sponsors, media partners and exhibitors at the Primex site in Casino. "One hundred per cent of our feedback has been sensational about the date." Primex Field Days are May 16-18 and Casino Beef Week festival runs for the following 11 days after that. Richmond Valley Council general manager Vaughan Macdonald was enthusiastic about the partnership with Primex. "Bring on May 16," Mr Macdonald said. Casino's Katie Brook sang at the launch and along with James Blundell will perform during the field days. Lance McQueen will be one of them with his Boer goats from his Wiangaree stud farm. "Goat meat is sweet," he said," and these South African goats adapt well." Father and son Doug and Cameron Bennett have been coming to Primex since the beginning. Primex started in 1985 and in 1986, Wally and Joy Bennett were there with their Braford bulls. Son Doug was only 26 years old then but when he took over Little Valley Brafords, he continued coming to Primex with his own children, and now with his grandchildren. "It's good marketing at Primex," he said. "People want to try different breeds." Little Valley Brafords celebrates 50 years at this year's 35th Norco Primex. The paddock to plate component of Primex was popular last year and with Casino RSM Club doing live cooking shows, there will more local food produce exhibits than last year. Norco Primex Field Days on May 16-18 at Casino Industrial Estate in Casino. More than 400 exhibitors, 850 companies and organisations. Go to www.primex.net.au.